In September 2015, the Wilmette Institute offered the course Sustainable Development and the Prosperity of Humankind. It was full with 43 learners and 5 faculty from 5 continents: Australia, Laos, Malawi, Switzerland, the United Kingdom, the United States, and Zambia. The course distinguished itself by a high level of meaningful discussions that continued throughout the grace period and even beyond. What was the reason for all that enthusiasm? Poverty: End poverty in all its forms everywhere. Food: End hunger, achieve food security and improved nutrition, and promote sustainable agriculture. Health: Ensure healthy lives, and promote well-being for all at all ages. Education: Ensure inclusive and equitable quality education, and promote life-long learning opportunities for all. Women: Achieve gender equality, and empower all women and girls. Water: Ensure availability and sustainable management of water and sanitation for all. Energy: Ensure access to affordable, reliable, sustainable, and modern energy for all. Economy: Promote sustained, inclusive, and sustainable economic growth, full and productive employment, and decent work for all. Infrastructure: Build resilient infrastructure, promote inclusive and sustainable industrialization, and foster innovation. Inequality: Reduce inequality within and among countries. Consumption: Ensure sustainable consumption and production patterns. Climate: Take urgent action to combat climate change and its impacts. Marine Systems: Conserve and sustainably use the oceans, seas, and marine resources for sustainable development. Ecosystems: Protect, restore, and promote sustainable use of terrestrial ecosystems; sustainably manage forests; combat desertification; halt and reverse land degradation; and halt biodiversity loss. Institutions: Promote peaceful and inclusive societies for sustainable development; provide access to justice for all; and build effective, accountable, and inclusive institutions at all levels. Sustainability: Strengthen the means of implementation, and revitalize the global partnership for sustainable development (in Finance, Technology, Capacity-Building, Trade, and Systemic Issues, including policy and institutional coherence, multi-stakeholder partnerships, and data, monitoring and accountability. The 17 sustainable development goals shine with a bright light in a world over-shadowed by dark problems—and are reason enough for most people to get excited. For the participants in the Sustainable Development and the Prosperity of Humankind course, the enthusiasm stemmed especially from the realization that the SDGs are a practical expression of Bahá’u’lláh’s vision for a new world order. For those of you reading this article, you have probably found yourselves thinking about the spiritual and ethical principles underlying these goals. One of the foundations of the sustainable development agenda is the acknowledgement that economic, social, and environmental aspects of development are linked, and that you cannot solve one without an holistic approach to solve all three. It seems to me that the economic, social, and environmental dimensions are mingled and intertwine as a complete system. We have, according to my interpretation of our [course] readings, a system that has an overemphasis placed on the economic dimension. Therefore, problems have accrued to the social and environmental dimensions because of the lack of balance. We are wanting to set the policy for a fully integrated system. The relative weakness of the social and environmental dimensions are threatening a system collapse through breakdown of the economy. Eight learners participated in a class project the purpose of which was to come up with a list of practical actions that they have taken or will take in their own lives to contribute to the achievement of some of the sustainable development goals. The further challenge was to see whether all of the learners together would be able to cover all 17 goals in one way or another. Each participant reported how they began and are continuing or intensifying their efforts on one or more of the sustainable development goals. The eight participants reported a total of 27 actions (including a few planned actions). These actions directly covered 15 of the 17 SDGs. Some of the goals are tricky to address as individuals, but, as all the goals and the learners’ actions and goals are strongly interconnected, we can honestly say that all SDGs were covered, a few more indirectly than others. The learners addressed many goals in multiple ways. There was a tie, with 7 actions for each, between goals No. 13 (“Take urgent action to combat climate change and its impacts”) and No. 15 (“Protect, restore, and promote sustainable use of terrestrial ecosystems; sustainably manage forests; combat desertification; halt and reverse land degradation; and halt biodiversity loss”). Many actions counted toward more than one goal. Can you guess which single action addressed the most goals? Review the 17 goals above, and think about what action might get the most mileage. One participant shared this action: “My husband and I have decided to become vegans.” This single action alone covered eight different SDGs. Here is how: Eating fewer animal products promotes “healthy lives” and “well-being for all” (Goal No. 3). It contributes to “sustainable consumption and production patterns” (Goal No. 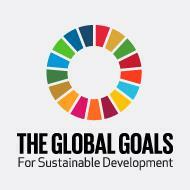 12) as well as to the conservation and sustainable use of “the oceans, seas, and marine resources” (Goal No. 14). It especially contributes to ensuring “availability and sustainable management of water (Goal No. 6) because the production of “a 1/3 pound burger requires 660 gallons of water” (http://www.latimes.com/food/dailydish/la-dd-gallons-of-water-to-make-a-burger-20140124-story.html). In addition, reducing meat consumption contributes greatly to Goal No. 15: “Protect, restore, and promote sustainable use of terrestrial ecosystems; sustainably manage forests; combat desertification; and halt and reverse land degradation and halt biodiversity loss”—because, among other reasons, nourishing people with beef requires ten times more land area (and with chicken, three times more) than that needed for a grain diet. As greenhouse gas emissions of livestock are an enormous factor in heating up the planet, eating less or no meat contributes significantly to Goal No. 13: “Take urgent action to combat climate change and its impacts.” In its broad impact, cutting down on meat consumption also helps to “End hunger, achieve food security and improved nutrition; and promote sustainable agriculture (Goal No. 2) and to “End poverty in all its forms everywhere” (Goal No. 1). As one might expect, the topic of diet developed into a passionate discussion in the forum discussions in the course on Sustainable Development. Participants pointed out other aspects of this issue. For example, livestock is needed for their manure because chemical fertilizers are based on fossil fuels that, as we now know, must be quickly phased out. Moreover, many people depend on animal protein because of the geographical area in which they are living and because of various other factors. Everyone agreed, though, that global consumption of animal products, especially beef, must be significantly reduced and that factory farms must be abandoned as they are cruel to animals and are extremely harmful to human health and to the environment. Eating lower on the food chain is also in line with the teachings of ‘Abdu’l-Bahá, Who said that in the future humans will get their nourishment from a vegetarian diet. There are other areas where the Bahá’í teachings are supportive of, or even a prerequisite to, sustainable development. One participant wrote “To be content with little, to take only what we need from this planet, should be our motto.” Another learner provided a practical example: “Wear clothing, and use products to their ultimate point, and recycle items by continuing to take them to Habitat Restore and Goodwill.” The connection to the words of Bahá’u’lláh addressed to the “true seeker” is clear: He or she “should . . . be content with little, and be freed from all inordinate desire” (The Kitáb-i-Íqán 214: 178–79). In another passage Bahá’u’lláh writes: “Fear ye God, and take heed not to outstrip the bounds of moderation, and be numbered among the extravagant” (Gleanings from the Writings of Bahá’u’lláh 118: 251). Continue, and renew the Green Energy option currently being offered by the local electric utility. This action means that one’s share of the electricity used comes from 100 percent wind sources. Reduce use of fossil fuels for heating by better insulating windows, doors, walls, and floors in buildings. Walk, whenever possible, to do shopping and attend local functions. Support local public transportation, and encourage policies that would expand and improve public transportation services in the region. Support community gardening and home-gardening activities. Use organic methods for lawn care and for community and home gardens, and promote permaculture. Plant hundreds of live oak trees and palms, and continue to enrich pastures naturally without synthetic products. Investigate fish farming that will provide a reliable food source for local and regional communities. Support, and, if time allows, volunteer at a local organic urban farm. Make a presentation at their local Bahá’í center to explain to their cluster the meaning and significance of sustainable development. Create a presentation about sustainability to offer to faith groups and/or Bahá’í communities. Plan a devotional meeting around the subject of sustainability. Host a study class on sustainability. It is not practical to list all the actions that participants in the Sustainable Development course are taking, but the actions above illustrate that living sustainably does not require a major project or event and often does not take a lot of time. We can integrate sustainable development into our daily lives, sometimes into our professional lives, certainly into our community lives, and into Bahá’í core activities. Are you inspired to follow the lead of the learners in the course on Sustainable Development and the Prosperity of Humankind? What actions can you add to the lists above? We would love to hear from you. Consider the challenge this way: Spiritual development can be expressed in more mindful consumption and sustainable practices. The act of service in such expressions contributes to further spiritual growth. Clearly, what is good for society and the environment is also conducive to the well-being of the individual and his or her spiritual development. Sustainable development truly means that all of us, according to Bahá’u’lláh must be part of carrying “forward an ever-advancing civilization” (Gleanings 109: 215).